“Throwback” Thursday is a weekly event, hosted here, that spotlights books from our past that have never truly left us.This week’s “flashback fiction” selection is: The True Story Of The 3 Little Pigs? 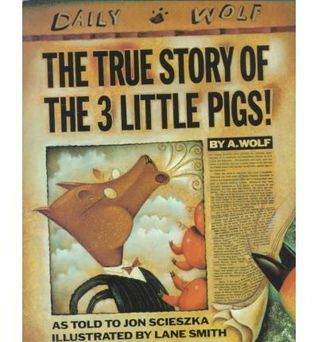 Am I the only one who hated the big bad wolf after hearing the first "fictional" story of the three little pigs in first grade? We all know the story. Wolf is hungry. First pig is stupid and builds his house straw. Then all over again until the wolf was full of piggy meat. Four or five years later, my mother read me this version. Poor Alexander T. Wolf has a cold and is longing to make a good cake for his mother. Turns out he has no sugar! From here, it's all down hill. He was FRAMED! I am ashamed for believing the three pigs. Although, they weren't alive to tell the story. Come to think of it... who told the story? I hope I never "meet" this person. They sent Alexander, the non Big Bad Wolf, to jail. If you haven't read this quirky rendition, you absolutely should!